Grind coconut and fennel seeds in a mixer adding little water. Grind it to smooth paste and keep aside. Heat oil in a pan or kadhai and temper mustard seeds & curry leaves. Add chopped onions and fry for a min on low flame. Add ginger-garlic paste and chopped tomatoes. Mash the pulp. Add turmeric powder, sambar powder and coriander powder. Cook for 2 mins. Add chicken powder, asofoetida and ground paste. Add 2-3 cup water and salt to taste. Cook it covered for 10-15 mins and remove from the heat. Serve hot with rice or dosa. If the tomatoes are too pulpy, then reduce the quantity of tomatoes to 3 or 4. This Kurma goes well with Crispy Dosa or Steamed Rice. Adding chicken powder is optional. You can instead try adding garam masala. wow this is nice.would love to have it with dosa! Looks delicious.. would love with appams or plain rice and appalams.. Delicious thakkali kurma. Love it. 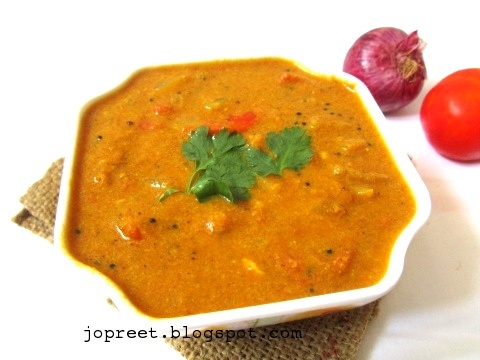 great combo with idly/dosa…looks very yummy!! Goes very well with idli or dosa. A lovely colourful kurma, mouthwatering here. Yummy combo with all tiffin variety..deletable gravy..
very inviting kurma with tomatoes 🙂 very yummy combo and a flavorful curry ! !